A 29-year-old man opened fire at the Christmas Market in the city of Strasbourg on Tuesday, killing three people and wounding 12 others. French police are conducting an operation near Strasbourg Cathedral to capture the man who went on a shooting spree on 11 December, having killed three people and injuring 12 others at the city's famous Christmas Market, Reuters reported. Deputy Interior Minister Laurent Nunez said that the manhunt is still underway, and the authorities are not sure if the suspect is still in France and if he has terrorist motives. He further added that five people are being interrogated over the shooting, according to Reuters. Nunez said that France was doing its best to fight Islamic fundamentalism, and that being on the Fiche-S list of people flagged as a potential security risk was not a threat criterium. France's Interior Minister Christophe Castaner earlier announced that about 350 officers, supported by two helicopters, had been deployed to find the suspect, who fled the crime scene. The fugitive has been identified and is known to security services; he was previously convicted in France and Germany and served both sentences. According to AFP, he was flagged by intelligence agencies during a prison visit where he was noted for violence and religious proselytism. 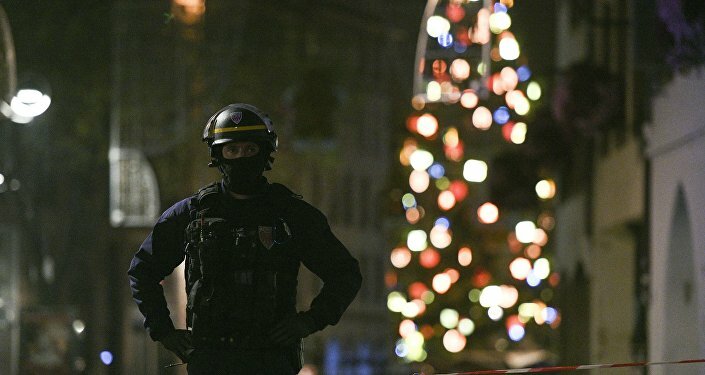 French authorities have raised the security level to "emergency attack" and reinforced border controls, as well as strengthened surveillance at all Christmas markets to prevent similar attacks.